Read the original article on the PBS NewsHour website. Dr. Joseph Fernando, investigator on the Climate Change Adaptation project, appears at 2:30 of the video. Watch on YouTube as well! CHICAGO | On a sweltering day in July 1995, Luxora Coleman returned to her Chicago home to find her husband, Oliver, unmoving on his living room couch. With a weak heart and only a ceiling fan to battle temperatures that had soared to 106 degrees, the heat wave had proved too much for him. He was pronounced dead later that day. Coleman's husband was one of thousands of residents left without power or air conditioning over the four days that summer when the heat index reached 120 degrees. Roads buckled, cars broke down and many areas lost power. And by the time it was over, more than 700 people, mostly the elderly and ill who live alone, had died due to heat-related causes. Since that devastating heat wave, the city has been working to prevent such a tragedy from occurring again by improving heat emergency warnings, opening summer cooling centers and stepping up efforts to monitor seniors during extreme heat events. But they're also working to engineer a city that can stay cooler even as temperatures rise. Chicago is part of that trend. The city's annual average temperature has increased by 2.5 degrees since 1945, according to this climate assessment created by a consortium of scientists and commissioned by the city. 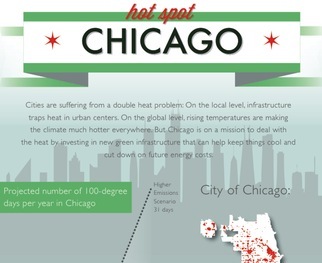 Like many urban areas, Chicago is also victim to something called the urban heat island effect. Simply, concrete and pavement, which absorb and trap heat, make cities like Chicago hotter than surrounding rural areas. Buildings soak up the sun's rays during the day and release that heat into the night. Joseph Fernando of University of Notre Dame has been studying the urban climate in both Chicago and Phoenix. He's also been studying the influence of climate change on the urban heat island effect. Fernando's research shows that Chicago is about four to five degrees warmer than the neighboring rural town of DeKalb, Ill., for example. That's partly due to continued urban development as well as global temperature rise, he said. The heat island effect, climate scientists are quick to point out, does not skew the global trends that indicate climate change is occurring. After all factors that impact temperature at different locations are accounted for, research has shown that urban sites are warming at about the same rate as rural sites, said Thomas Peterson, chief climatologist for the National Oceanic and Atmospheric Administration. "Climate change basically exacerbates the effect at night," Fernando said. As the global temperature increases, a city's developed areas will retain even more nighttime heat than other areas. To battle the heat, city officials have undertaken an ambitious $7 billion plan to build a "new Chicago," said Karen Weigert, the city's chief sustainability officer. That means renovating citywide infrastructure from sidewalk to rooftop. Chicago's City Hall, for example, contains a spectacular rooftop garden. From native woodland grasses to sunflowers and asters, plants arranged in radiating bands of color bloom throughout the seasons in a sunburst pattern. The roof, 12 stories high, contains 23,000 square feet of more than 100 plant species. "It's really the Rolls-Royce of green roofs." said Michael Berkshire who administers green projects for the city. Some areas of the roof have rolling terrain with an added 18-inch layer of soil to support trees and shrubs. A rainwater collection system irrigates the roof and several bee hives pollinate the many flower varieties. The plants on the rooftop soak up the sun's heat to evaporate water, keeping both the buildings underneath and the air above it cooler. One half of City Hall's roof used to be black like most roofs, and on a hot day when they measured the difference between the two sides, the surface temperature was nearly 80 degrees hotter on the black top side than the green side. Chicago estimates that this green roof saves City Hall about $3,600 a year in heating and cooling savings. "If every rooftop in Chicago was covered with a green roof, the city could save $100 million in energy every year," said Jason Westrope, a developer for Development Management Associates, who has overseen the building of green roofs in the city. See images of some of Chicago's most impressive green roofs. Green roofs also help absorb stormwater runoff. That's important because the city's stormwater drains through its sewers, and if the system gets overloaded after a big storm, that wastewater is in danger of backflowing into the river, the lake, and even into people's basements. Chicago already has 359 green roofs covering almost 5.5 million square feet -- that's more than any other city in North America. But city planners are pushing for even more. Chicago has mandated that all new buildings that require any public funds must be "LEED" Certified -- designed with energy efficiency in mind -- and that usually includes a green roof. Any project with a green roof in its plan gets a faster permitting process. That combined with energy savings is the kind of green that incentivizes developers. "We're looking at placing landscape wherever we can, and it's so much more difficult when you have a densely developed city." Berkshire said. "Rooftops are one of the last frontiers." But the city is looking beyond buildings -- they're hitting the streets too. "Our streets represent 23 percent of the land area here in Chicago." said Janet Attarian, project director for the city's transportation department, "And it needs to be more than just a place where we move vehicles and goods. It needs to be our front doors." 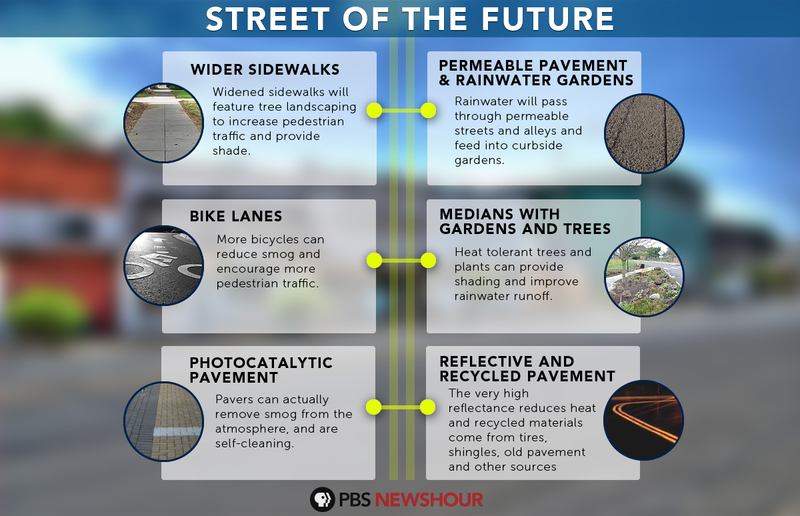 That's why they're designing new streetscapes that integrate technology and design elements from widened sidewalks for increased pedestrian traffic to tree and plant landscaping that provide shade. The pavements are made of a light reflecting material mix that includes recycled tire pieces and lanes coated with a microthin concrete layer that keep the street from absorbing so much heat. Chicago's 1,900 miles of alleyways traditionally absorb heat and cast away potentially cooling rainwater. But new 'green alleys' use permeable pavement that absorb rainwater. As that underground water evaporates that also keeps the alley and air around it cool. "We need to make sure that people can get from A to B safely, that the streets aren't flooding, and that they're not buckling because of the heat," Attarian said. A version of this report will air on NewsHour's broadcast on Oct 9, 2012.